Two tiny boats bobbed on the whitecapped Gulf of Mexico, off Lido Beach, Florida. One, a hard-bottomed inflatable, trailed the other, an Optimist pram skippered by the then-11-year-old Hallie Schiffman. The young skipper had listened carefully to her coach, Brian Payne, as they had motored out to practice with her Opti lashed to the inflatable’s bow. Now she was in total control, having the time of her life, and concentrating on maneuvering her boat through deliberate sequences while adding onto her burgeoning skills as an award-winning young racer. Passersby easily might have assumed the young sailor was in trouble. The gusty 34-knot wind had already shut down the Sarasota Youth Sailing Program’s practice for the day, and the wind showed no sign of abating. At times, only the tip of the dinghy’s mast appeared above the spray-topped crests, yet the little boat swooped and weaved between the swells with the patrolling inflatable in close pursuit. Mark Schiffman, Hallie’s father, remembers that 2011 day very well. They loaded the boat onto the inflatable, entered the gulf, and headed south. They stopped about six miles beyond Big Pass. There, Coach Payne put the pram into the water, and Hallie slid aboard and sailed for home. At first, taking on these kinds of challenges didn’t come naturally for Hallie. She was terrified when her parents signed her up for a summer sailing camp in 2010. “She had just come out of the summer camp, and she loved to sail at that point,” explained Andrea Schiffman, Hallie’s mother. “But she didn’t know about the racing part, going against other boats. Hallie’s first regatta results were less than spectacular. “I didn’t like to go around the marks with that whole cluster of boats. I didn’t want them to hit my boat, and I didn’t want to run into them, so I went really, really far out,” she recalled. So far, in fact, that spectators, other racers, and her parents were left wondering if she was leaving the course altogether. No one ran into her, she acknowledged, but when it came to winning, the strategy didn’t work. But her anxiety about collisions was short-lived. 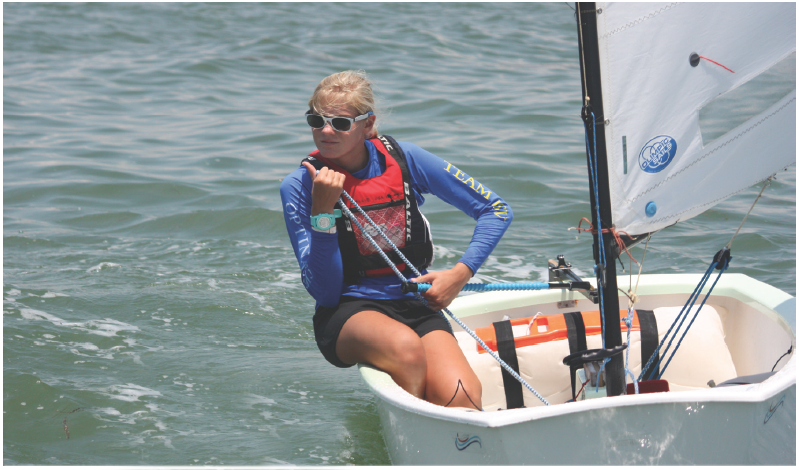 Just six months after Hallie completed her first sailing camp, she joined Team FOR, a traveling team that competes in regattas around the country, including nationals. Joining that team proved to be a defining moment not only for Hallie, but for her entire family. Andrea calls it “their awakening.” At that point, the Schiffmans were driving Hallie 90 miles to Clearwater every Saturday and Sunday from their home in Englewood, where they lived at the time. “We were spending about $700 to $800 a month just for fuel to get to and from the team training facility,” Andrea said. When Hallie made a friend on the team, her parents allowed her to stay over on Saturday nights, but the family realized that wasn’t going to be enough. 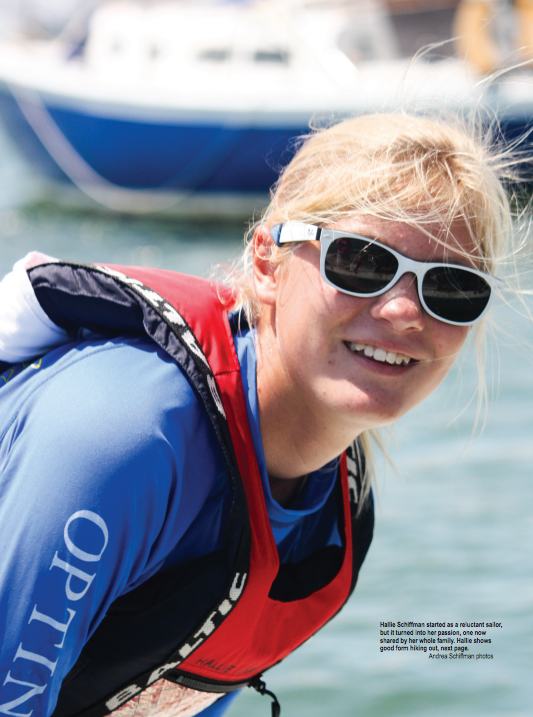 In June 2011, Hallie received an invitation to compete in the Scotia Banks International Optimist Regatta in St. Thomas, U.S. Virgin Islands. The Schiffmans received the paperwork, and they said their eyes bulged when they saw the cost. Now Hallie’s parents were feeling the one-two punch of the financial strain and the separation. Their daughter boarded the flight to St. Thomas with her coach, seven teammates, and two team moms; her parents wouldn’t see her again for two weeks. With no Wi-Fi, limited funds, and limited cell service, Hallie wasn’t able to keep in close touch, and the Schiffmans were left waiting and wondering. Hallie, however, had no such concerns. Once Hallie returned from St. Thomas, she was off to Sandusky, Ohio, for the Optimist National Championship which catapulted her into a weeklong trip to the BMW Team Race Cup in Berlin, Germany. This was another moment of truth for the Schiffmans. They organized a spaghetti dinner fund-raiser and held a garage sale, but it wasn’t enough. Extreme budgeting and planning weren’t going to keep Hallie on the water. Each racing event cost between $3,000 and $5,000, not including airfare, travel incidentals, drysuits, international calling plans, parent travel, ongoing lessons, and boat maintenance and repair. Hallie’s bold moves were winning races. Now her parents were going to have to make some bold moves themselves. They started with selling their Englewood home, which they designed and built years earlier. They moved north to Sarasota, which put Andrea closer to her job. 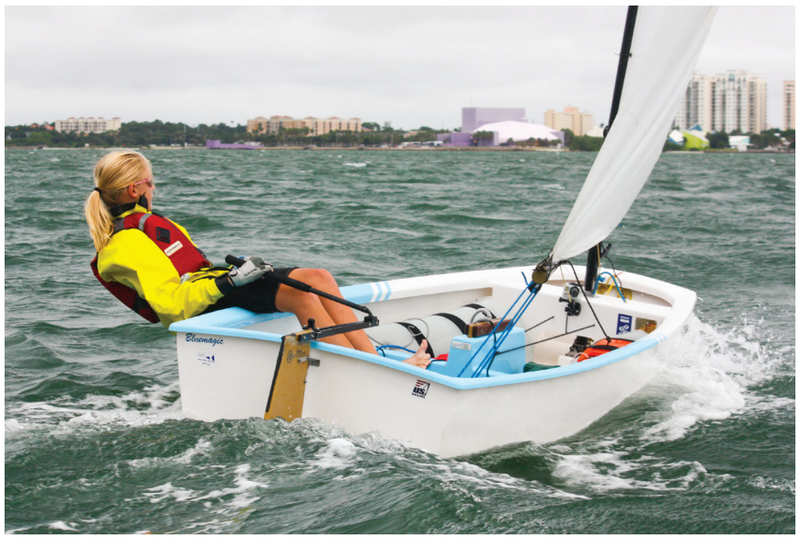 Mark started working for the Sarasota Sailing Squadron, the much-loved, all-volunteer sailing club that has become legendary along Florida’s west coast. As Hallie’s primary training base, this created another efficiency for the family. Now, the Schiffmans spend less time in the car, Hallie spends more time on the water, and many more opportunities have come calling. Mark occasionally receives an unexpected phone call that leads to additional resources. One came from a woman in England who had just gone through a divorce; she got possession of a Florida-based sailboat and wanted someone to take it off her hands. “She didn’t want the responsibility of having the boat while she was overseas,” he explained. The woman had offered the boat to a friend who knew about Hallie’s racing career, and suddenly Mark found himself sailing the donated 25-foot, fin-keeled Catalina from Venice, Florida, to Sarasota, where he cleaned her up, made all the necessary repairs, and sold her. It was the first of eight rehabilitation projects that have included a Hobie 14 that Mark gave to one of Hallie’s coaches in trade for more lessons, as well as a couple of additional abandoned Hobie Cats, and even a 14-foot Elco electric launch. The family’s efforts are paying off. Hallie was one of just 34 young people in the United States to be invited to participate in the Volvo Ocean Racing Academy when they made their Miami stop in 2011. Since 2012, she’s won several regattas, traveled back to St. Thomas and to Bermuda, collected more than 50 trophies, and recently capped off 2014 by being named Florida Young Woman Sailor of the Year, and her name appears on the perpetual trophy alongside that of Olympian Paige Railey, one of her idols. These days, Hallie races a Radial Laser. In her first three Laser regattas, she took first place twice, and she competed in the Cressy Qualifiers in Charleston, South Carolina, where she placed a hard-fought 16th overall. She also competes aboard her high school team’s 420s and is training on multihulls, all the while maintaining straight As in school. She has a larger goal in mind, and her parents are relieved that the law won’t allow her to pursue that goal just yet. Hallie’s reading list now includes books on diesel mechanics and open ocean navigation. In the meantime, the Schiffmans plan to immerse themselves further in the racing life. This summer, Mark is planning to unveil a customized trailer for Hallie’s Laser and the restored 13-foot Boston Whaler that will serve as his chase boat. During the four-plusweek circuit, Hallie will compete in three or four championship events. The last three years have been filled with sacrifices for the Schiffmans, but whether to make them was never a question, Andrea said. “How do you have a kid who shows such passion not do it?” she said.